These are the first monkeys with customized mutations were just born in China, marking a new era in precision gene editing. (Read: bringing us closer to a Gattaca-like future where designer babies grow into perfect people that never get sick.) They are twins. 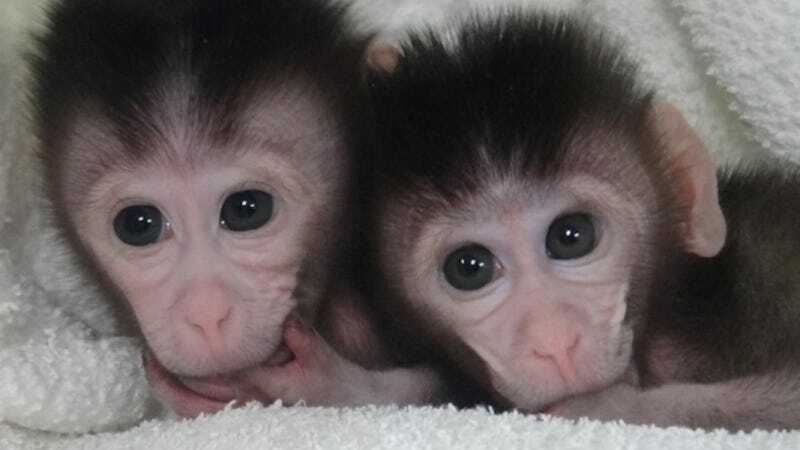 Working out of the Model Animal Research Center of Nanjing University, a team led by Xingxu Huang successfully engineered these twin cynomolgus monkeys(pictured above) to have two mutations: one affecting the regulation of metabolism and the other affecting healthy immune function. It's not the first time that scientists have created customized mutations—they did it in mice a while ago—but it is the first time that a primate so genetically close to humans has been involved. And these are exactly the kinds of mutations you might want to trigger in order to make skinnier, healthier humans. This was not easy. The researchers targeted three specific genes in the experiment but were only able to disrupt them 10 to 25 percent of the time in lab tests. They targeted the genes in 180 single-cell monkey embryos, 83 of which were implanted in living mothers. Those dozens of embryos yielded only ten pregnancies and, out of those pregnancies, only one birth. "This is an important step," MIT biologist Feng Zhang who was not involved in the study told Nature. "It shows that the system is working." Indeed, it does. It's a pretty creepy system, too. Using techniques like this, scientists might one day be able to create designer babies, custom-made human beings with desirable features that aren't susceptible to genetic diseases. Actually, after this test, scientists probably can do that. On a smaller, more immediate scale, though, they can eradicate specific diseases. That is, if the world can get on board with the idea ethically. And that's a big "if."